The 1951–52 FA Cup was the 71st season of the world's oldest football cup competition, the Football Association Challenge Cup, commonly known as the FA Cup. Newcastle United won the competition for the fifth time, beating Arsenal 1–0 in the final at Wembley. For the qualifying rounds, see 1951–52 FA Cup Qualifying Rounds. At this stage clubs from the Football League Third Division North and South joined those non-league clubs having come through the qualifying rounds. Matches were scheduled to be played on Saturday, 24 November 1951. Eight were drawn and went to replays, with three of these going to second replays. The matches were played on Saturday, 15 December 1951. Seven matches were drawn, with replays taking place later the same week. Three of these replays went to a second replay, with the Tranmere Rovers–Blyth Spartans game going to a third. The 44 First and Second Division clubs entered the competition at this stage. The matches were scheduled for Saturday, 12 January 1952. Nine matches were drawn and went to replays, with one of these going to a second replay. The matches were scheduled for Saturday, 2 February 1952, with the exception of two postponed matches. Three games were drawn and went to replays, which were all played in the following midweek match. One of these then went to a second replay before being settled. The matches were scheduled for Saturday, 23 February 1952. The Leeds United–Chelsea game went to two replays before Chelsea won the tie. The four Sixth Round ties were scheduled to be played on Saturday, 8 March 1952. There were no replays. 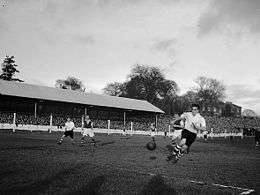 The semi-final matches were intended to be played on Saturday, 29 March 1952, although the Chelsea–Arsenal fixture was not played until the week after. Both matches went to a replay, with Arsenal and Newcastle United eventually winning their ties to meet in the final at Wembley.